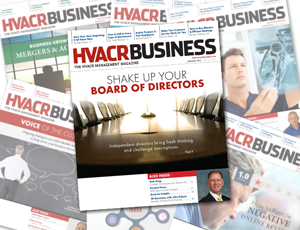 By now, you should have received your January issue of HVACR Business (if you haven’t, go check your mailbox … I’ll wait). Putting together the January issue each year is a unique experience. While we plan each issue a few months in advance, most of the work in actually pulling it all together happens within the last two weeks of the month prior — and for January, this means it happens right before Christmas. Second, because January is when the industry gathers for the AHR Expo, I’ve got to strike a balance between pre-show coverage and our regular business management content. So, it’s always a fun challenge, which I really enjoy. I wanted to make sure the thousands of attendees at the AHR Expo had a clear idea of what our magazine is all about when they pick up one of the bonus copies available at the show. That’s why our cover story this month is on a topic only we would cover — Your Board of Directors. “An effective board of directors that is strategic and productive can help to significantly strengthen the business,” writes Kelly LeCouvie, Ph.D.
She goes on to say that independent directors bring fresh thinking and challenge assumptions upon which you have managed your business for years. It’s really a great article that has solid advice for you, no matter if you’re a small family operation or big commercial contractor. Our three additional feature stories cover topics which are also important to you: sales & marketing, employee engagement and customer service. Our experts outline specific strategies you can use to better your bottom line in each of these areas. Speaking of your bottom line, no issue of HVACR Business would be complete without Ruth King’s column. This month, she offers up an interesting idea for getting your employees on board with raising profits. Contests Can Help Increase Your Bottom Line is sure to be a hit, as are all of Ruth’s columns. For Terry’s 20 Questions this month, he revisits with one of the top industry influencers: John Galyen, president of Danfoss North America. Though John has always been there to offer educated commentary for us, Terry last interviewed him for 20 Questions nearly 10 years ago, so the two certainly had a lot to catch up on. Finally, I mentioned earlier about making sure we had some information about the AHR Expo … In addition to my Editor’s Notebook (and web exclusive Show Preview), our product focus this month features the 10 winners of the AHR Innovation Awards. Oh, and as an added bonus, we’ve started a new section in the magazine this year! We recognize that many industry suppliers have great business advice to offer, so our new sponsored content section called Business Insights will feature information in a number of industry categories from some of the top influencers in HVACR. This month, you should check out Zoning and Fleet Graphics. It really was a fun issue to put together, and one which I’m sure will provide you with a multitude of action items for your business.